With a full-day pass to Xplor Park, you can try out a ton of adventures with a single booking. 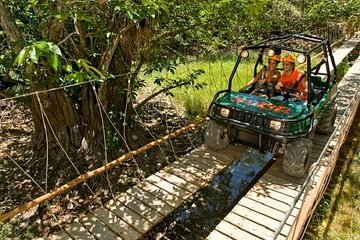 Raft through underground caves, fly down ziplines, and get a look at jungle wildlife, plus drive a personal 2-seater land-and-water amphibious vehicle around the park. This self-guided tour lets you explore on your own schedule, stopping to enjoy a buffet lunch whenever you get hungry. Wear swimsuit, comfortable beach clothing and water shoes. Bring a change of clothes and towel. Sunscreen and insect repellant must be free of chemicals and biodegradable to be used in the Park. Some activities are not recommended during pregnancy, persons with heart disease, diabetes, epilepsy, asthma, hypertension or claustrophobia. Minimum age: 5 years. Child price applies between 5 – 11 years old, but must show official ID. Only over 18 ´s with proof of driving license may drive the amphibious vehicles. Minimum age required for Hammock Splash activity: 6 years. At Zip-lines the minimum height required is 3.6 ft. The minimum weight required is 88 lbs. and a maximum of 300 lbs. The circumference capacity of the harness belt is 51 in and 27 in for the legs.